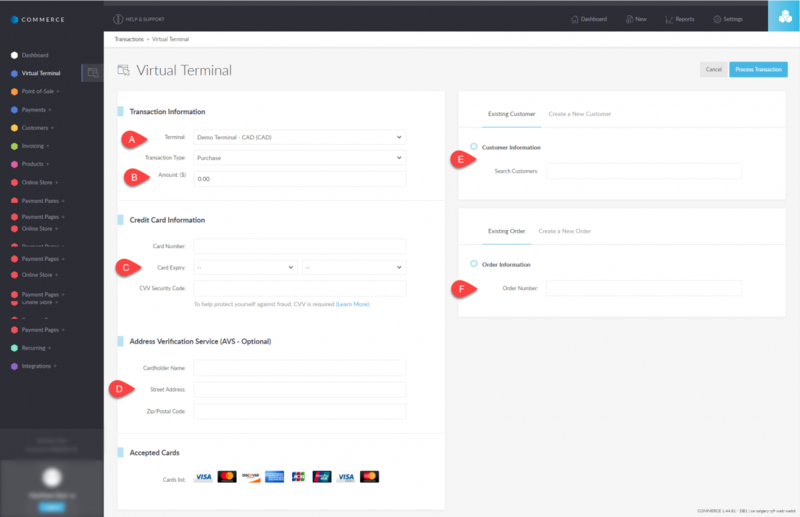 To process a sale, pre-authorization, capture or refund on the virtual terminal, please follow the steps below. To change the default transaction type, click here for instructions. c. Enter customer's credit card information. Keep in mind that if this is a transaction for a customer who is already in your system you can simply go to step e. or f. CVV is a mandatory requirement. d. Enter customer's address. This is not a mandatory step however, it is an important tool for preventing fraudulent transactions (the data is used for the AVS and Helcim Fraud Preventer functions). f. You can enter the order number here if this transaction is for an existing order. All the information within the order that is required to process the transaction will auto-fill. You can create a new order by toggling over to Create a New Order. If creating a new order, the default order type is set to INVOICE, however, you can change this by following these instructions. Please note that if you would like line items, tax calculations, shipping, etc., it is best if you go through the Orders tab to have all these details available. 4) Once your transaction is processed the transaction details and receipt will be displayed. b. to analyze the level of risk for the transaction using the Helcim Fraud Defender click on Analyze Risk - for more information on Helcim Fraud Defender, please click here. ***PLEASE NOTE: the analysis is an estimation of risk based on transaction factors listed in the analysis details. There are no guarantees made on the transaction or chargeback outcome. c. You may also Void the transaction from this page (if you've made a mistake), email a copy of the receipt, save the receipt as a PDF, or print the receipt. ***PLEASE NOTE: if you have processed a transaction for an existing customer with their email address on file, the customer will automatically get an email receipt. You can disable automatic receipts, to view more on automatic email settings click here.